Devil’s Island is another name for a group of three islands also known as the Iles du Salut island group in the Atlantic Ocean. The three islands are called Ile Du Diable, Ile Royal and Ile Ste Joseph. Our visit today was to the island called Ile Royale. It is located approximately nine miles off the coast of French Guiana in South America just north of the town of Kourou. It has an area of about 70 acres. 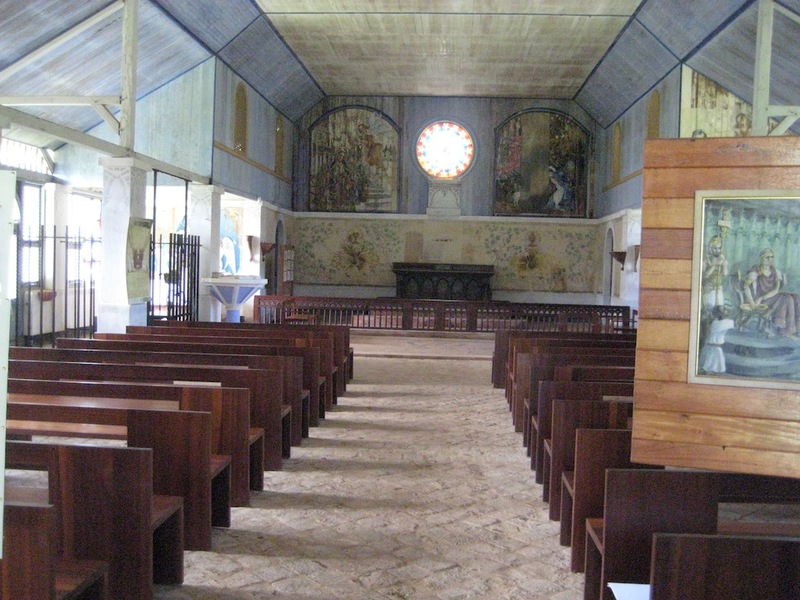 The island was a part of the controversial French penal colony of French Guiana for 101 years, from 1852 to 1953. 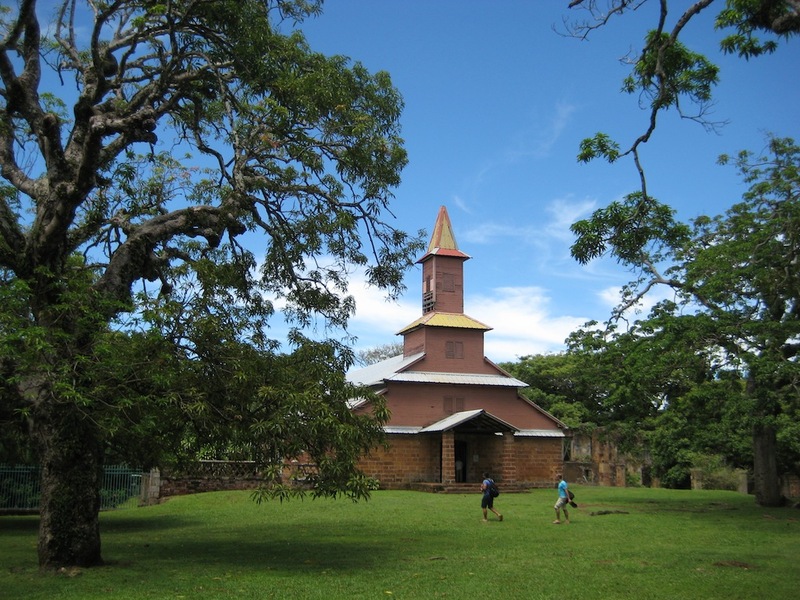 In spite of its being the smallest part of the penal colony, it is the most famous due to its use for the internal exile of political prisoners. The harsh conditions and rampant spread of diseases on the island guaranteed that more than 80,000 prisoners were never seen again. The remote location, rocky coastline and treacherous waters made escape virtually impossible. 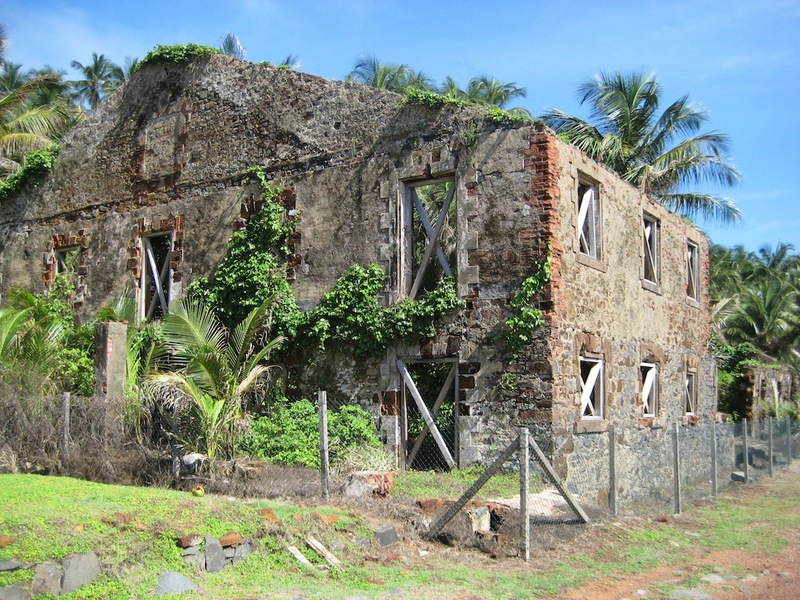 In 1938 France stopped sending prisoners to Devil’s Island, and in 1953 the prison was closed forever. Since tourism facilities have been added, the islands now receive more than 50,000 visitors a year. Our visit to this small island was quick, as our all-aboard time was 2:30pm. The island has no dock large enough for a ship of our size, so we used tender boats to go ashore. Once on the island there are several grass or gravel paths you can follow to explore the island. To give you an idea about the islands size, it takes about 45 minutes to walk around the perimeter of the island. The island is very lush and tropical in feel with palm trees, hibiscus bushes and dense vegetation. The shoreline consists of large rocks. 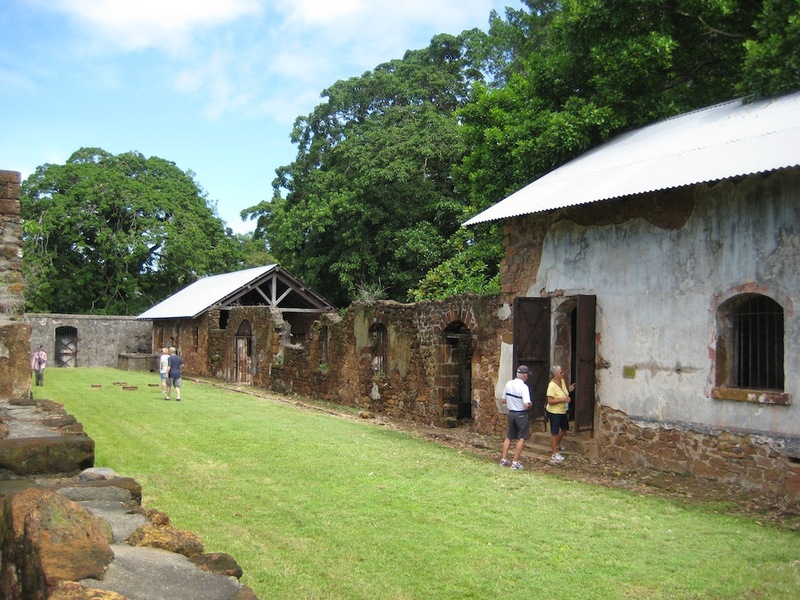 The center of the island is elevated and contains the majority of the ruins from the convict community. Ruins of the old barracks, chapel, lighthouse and hospital are still visible. The former guard’s mess hall has been restored as a restaurant and hotel, but it is far from luxurious. There is a small cemetery on the island and the director’s quarters have been restored and contains a small museum with photos and maps, unfortunately all of the descriptions were in French. The island was a pleasant place to explore although the heat and humidity were enough to make you moist from head to toe. Monkeys were frequent sights around the island, as were peacocks, parrots, humming birds, agote (large rodents) and iguana. A protected bay is set up as an area for swimming in the ocean. We stopped at the hotel bar with our friend Jenn, for the famous Devil’s punch. They serve this concoction in very small Solo plastic cups, which look very unassuming. I didn’t seem to be affected by the turpentine tasting drink that burned as it went down, but Jenn started laughing and saying she was drunk before she had finished the tiny cup. We are not too sure what the punch is made of but it was an experience. The afternoon sail away party included what was called the Grand Voyage Swap Meet. This was an opportunity to sell, trade, or give away any items you may not have room to take home, or maybe it was a souvenir that you now thought “What Was I Thinking?” Well, people brought everything they could get their hands on to the swap meet including chocolates left on their pillow each night, clothing, shoes, gifts received from the ship on formal nights, souvenirs and more. The crazy thing was that there was someone who bought most everything that was available for sale and everyone seemed to go away happy. In addition to the swap meet, there was an ice carving demonstration and games for the guests to play. The orchestra played music but the ship didn’t sail. There was a problem with the hydraulic lift on one of our tender platforms that fold out from the ship and it would not close. It took the crew several hours to get the platform back in place and we could finally get underway about 6:30pm. The evening’s entertainment was a movie titled Papillon based on a book written by Henri Charriere in 1968 about Captain Alfred Dreyfus’ escape from Devil’s Island along with a companion by the name of Sylvain. They used sacks filled with coconuts to act as buoys and drifted in the rough seas for several days before reaching the mainland.